Korea has come a long way from "I can't find anything I want :(" to "they have this?!!~~(finally!)" Korea is catching on with the gourmet scene and high quality organic goods. 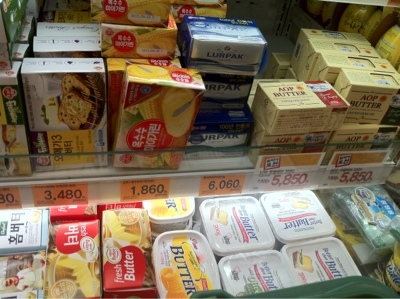 Just look at the butter variety in Emart (Gongdeok branch). Btw, Emart is my favorite store :) It's the "Target" of Korea. They sell everything from grocery - home goods - furnitures - wine - beer - gourmet/foreign food. I don't know what it was, but I gave it a quick scan.... I haven't bought butter or had butter on toast for the longest time. 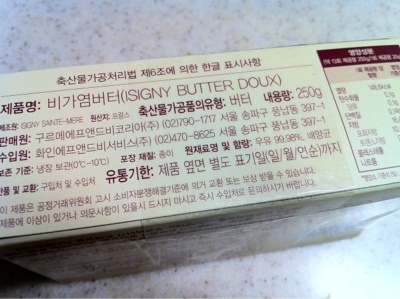 Oh... French butter?!!! Made from 99.98% milk. I'm sold. A good impulse buy nonetheless. 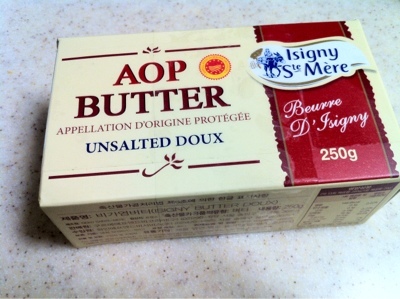 I really enjoy butter on toast now, but I will just have to tone it down on how much I slather on my toast... it's just so good~~ the melt in your mouth quality that makes you want more.